If you already have a PPC search campaign running in Google Ads and would like to improve it by restructuring your keyword list, follow these steps. To start, go to your Google Ads account and export your campaign as a .CSV file. 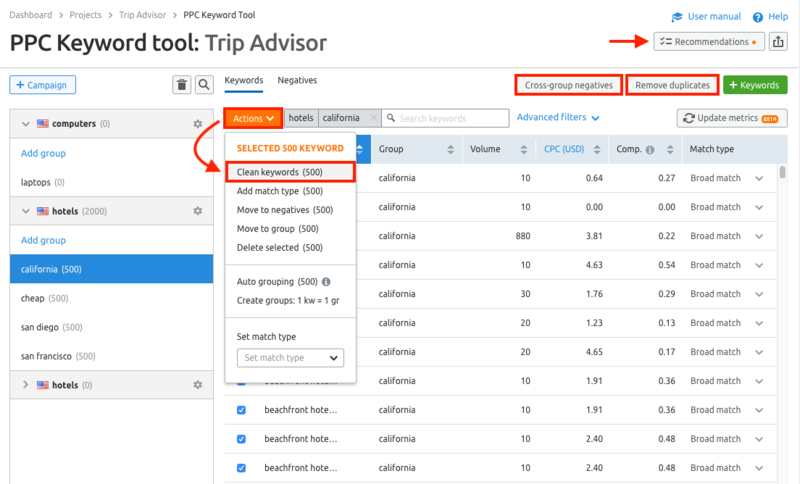 Then go to SEMrush and set up the PPC Keyword Tool under Projects and import your file of keywords. For detailed instructions on how to upload one of your existing campaigns to SEMrush, read this article. From here you can use SEMrush’s recommendations to automatically restructure your list. After making changes you will be able to export the updated keyword list from SEMrush and reupload it to AdWords Editor and measure the impact of the changes from your Google Ads analytics. Clean keywords to get rid of special characters, numerals, unnecessary articles, prepositions, interjections, and conjunctions. 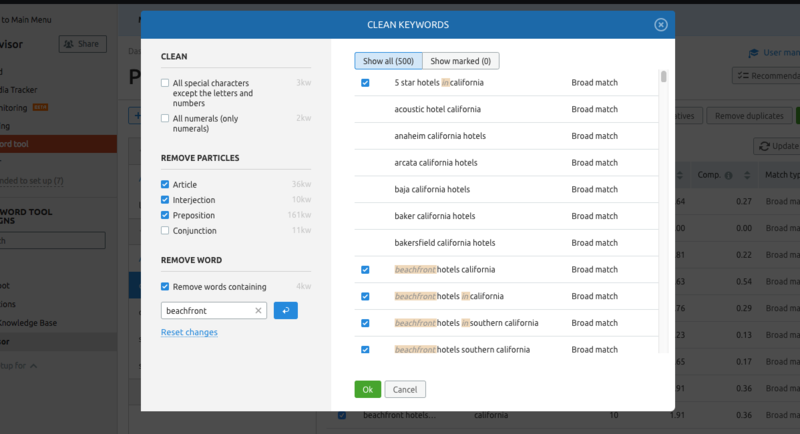 You can also clean out keywords containing specific word (“Remove words containing” button) from your campaign. This is a quick way to streamline the focus of your campaign and remove any ineffective keywords that are hurting your budget. Add automatic cross-group negatives to prevent your ads in different ad groups from competing with each other in the results. If you have some of the same words in two groups, Google might run two of your ads at once and your click through rate will suffer. 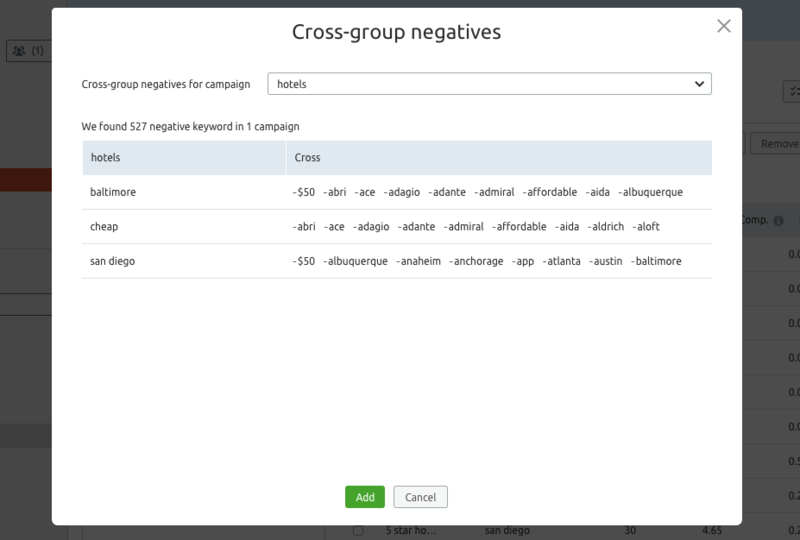 Cross group negatives automatically add negative keywords to your groups to prevent any “ad-poaching” within your campaign without removing the original keywords from your groups. Remove empty groups to get rid of any groups that are in your campaign but have no keywords. This option will only be available to you if SEMrush detects groups in your campaign that are empty (see below). After making changes to your keyword group, export your campaign from SEMrush and upload it to AdWords Editor. 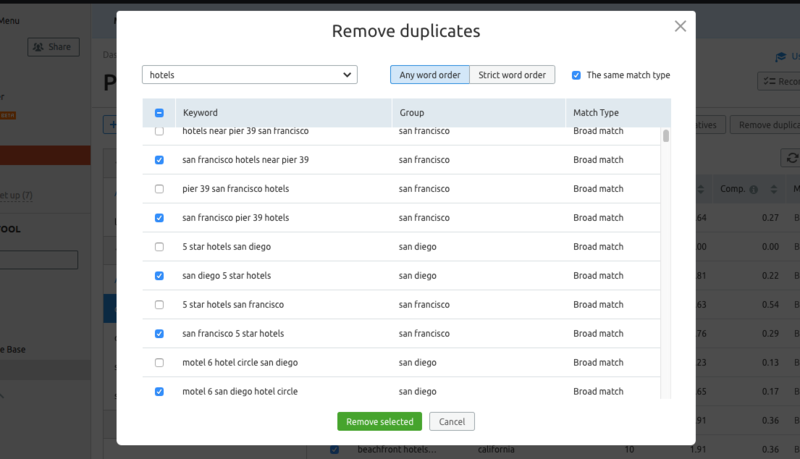 Now your keywords are restructured and you can test to see how your campaign performs as a result! For more instructions on fixing up your PPC campaign in SEMrush, refer to this user manual.